"WHAT IS A MEDIATION CERTIFICATE?" 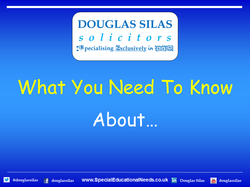 There are two pathways to mediation regarding Part 3 of the Children and Families Act 2014. There is mediation of issues that can be appealed at the tribunal and there is mediation of the health and social care element of the EHC plan which cannot be appealed at the tribunal. Precisely when a mediation certificate is issued will depend on which pathway has been taken. "ISSUES THAT CAN BE APPEALED AT THE TRIBUNAL"
Parents and young people are required to contact a mediation adviser before registering their appeal at the tribunal, with the exception that they do not have to do this if their sole purpose for appealing is against the name of educational institution, the type of educational institution that has been specified on the EHC plan or appealing against the fact that no educational institution has been named on the EHC plan. When a mediation adviser has been contacted and as a result the parent or young person decides NOT to proceed with mediation, the adviser will issue a certificate within 3 working days of the parent or young person informing them of their decision not to mediate. The certificate will enable the parent or young person to lodge their appeal. This can be done either within 2 months of the original decision being sent by the Local Authority ('LA') or within 1 month of receiving the certificate, whichever is the later date. If the parent or young person does decide to proceed with mediation, the LA must participate. If the LA is unable to arrange the mediation, it must tell the mediator within 30 days. The mediation adviser must then issue a certificate within 3 working days. Once the parent and young person receive it, they can then decide whether to appeal immediately or wait for mediation to take place. If the parent or young person initially wants to go to mediation but then changes their mind, they can contact the mediation adviser who will then issue a certificate with which an appeal can be registered. A certificate is also issued within 3 working days once mediation has been completed, confirming its conclusion. If the parent or young person still wants to appeal after mediation, they must send the certificate to the tribunal in order to register their appeal. Parents and young people have 1 month to register their appeal from receiving the certificate or 2 months from the original decision by their LA –whichever is the later date. The certificate will state that mediation has been completed and when. The tribunal will make its decision independently; mediation meetings are confidential and will not be seen by the tribunal. "ISSUES THAT CANNOT BE APPEALED BY THE TRIBUNAL"
Parents and young people can mediate about the health and social care aspects of the EHC plans; however, they do not have to consult a mediation adviser before they do so. "EXCEPTION TO THE RULE ON NEEDING A CERTIFICATE"
An application can be made to the tribunal under its case management powers (Rule 5 of the Tribunal Procedure Rules 2008) to proceed to appeal without a mediation certificate, the tribunal will be able to allow this to happen under its case management powers.